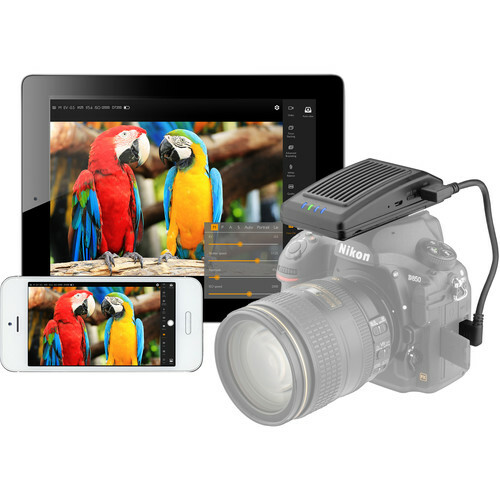 Shoot images or video wirelessly through the Vello LW-500 Extendá Plus Wi-Fi Camera Controller for Select Canon, Nikon, and Sony Cameras. Connecting the Extendá Plus to your camera via your camera's supplied USB cable, it creates an ad-hoc Wi-Fi network with a range of 196.9 feet. This allows you to connect to your computer or mobile device. Use the user-friendly Extendá app, which operates on iOS, Android, Mac, and Windows platforms. The app enables you to remotely adjust camera settings such as ISO, aperture, exposure compensation, and shutter speed. The available Live View mode provides a feed of your camera's view on your device, enabling Touch Focus and many other functions at your fingertips. Setting the app in auto viewing mode streams photos to your device at 10 MB/s so a client can view the images as you are shooting. Other features include bulb, focus stacking, and an intervalometer through the app as well. The Plus is powered by a rechargeable lithium-ion battery with a three-hour battery life. Sony: Most cameras are supported, however not all functions of the Extendá are available. Please see the manufacturer's Sony compatibility chart for detailed compatibility information. * Use the USB cable that is supplied with your camera. The Extendá Plus connects to a camera directly via a USB cable and then creates an ad-hoc Wi-Fi network, which allows you to remotely control a camera using an application available on IOS, Android, Mac, or Windows devices. The Wi-Fi network has a range of 196.9 feet. Remotely change your camera settings such as shutter speed, ISO, aperture, exposure compensation, and white balance via a smartphone or computer, and live view mode provides a real-time stream from the camera to your device, which allows you to preview images on a larger screen. Set up the app for auto viewing of images to have each image streamed to a mobile device or computer immediately following capture. This allows a client or assistant to easily review images as they are taken. Also, you can use the Extendá app to browse images on the card and then select images to save to your mobile device or computer. The Extendá app supports touch focus/tap-to-focus functionality. This means you can just tap on your device's touchscreen to select which area of the scene to focus on. Alternatively, you can also manually control focus by adjusting the focal plane forward or backwards in small increments. Create timed exposure images, set a delayed timer for exposure, or use the intervalometer for time-lapse photography through the app. A bulb mode is available as well for long exposures. Focus stacking will allow you to take a series of photos with varying focus points that can be combined in post-processing software to create a single image with a wide depth-of-field. Set up bracketing in order to make sure you get the perfect exposure. This mode offers options for exposure bracketing using shutter speed, aperture, ISO, and exposure compensation. This tool can be used to help create HDR images using post-processing software. On your device use the rule-of-thirds grid, which helps you to compose your shot whether you are shooting photography or video. Powered by a built-in 3.8V 3200mAh rechargeable lithium-ion battery, which has a 3 hour battery life. LW-500 Extend00E1 Plus Wi-Fi Camera Controller for Select Canon, Nikon, and Sony Cameras is rated 3.6 out of 5 by 5. Rated 1 out of 5 by Michael from Software needs major work Vello obviously never tested their software (even the recently revised version) with their new LW-500 hardware as it simply does not work as advertised. The touch focus works occasionally, but the system closes most of the time to make the great idea of this product practically useless. Rated 3 out of 5 by Nicholas from Hardware is great, software is awful. It works, but as another reviewer noted, the software is garbage. It crashes to the desktop every time I try to change the save image folder, or set it to auto-import on start. On the plus side, its fast - it pulls 36mp D800 JPEG+RAW in two or three seconds per image. Rated 5 out of 5 by Kyle from New Perspectives! I recently got to try out the Extendá Plus, and I have to say, Im a fan! I had zero trouble with the software - as I see some others did. Using it around the house and the studio have been helpful for feeling out the app, but I am really looking forward to getting more use out of it in the field. So far, I am confident that it will work well! As a wildlife photographer, remote systems like this open the door for interesting perspectives, rather than typical telephoto views. I have a few different projects in mind that I sure will try and use the Extendá for! It works well on my canon 5D mark II - an older body. Nice to keep this in mind when buying! Like I said, this device really opens the door to new things. There are so many possibilities - more than I could ever need! Would recommend. Rated 4 out of 5 by Michael from Good for General & Astrophotography There are many add-on devices available for control camera. There is even software for some models that provide live view and photo capturing. I have used the Nikon iOS apps WMU and SnapBridge. WMU worked fine with the D7200 DSLR, but SnapBridge for the D850 DSLR was unreliable. Neither app worked with the other camera and they did not have an intervalometer function. The Vello Extendá Plus apps worked as I hoped. The only thing that somewhat surprised me was the image quality of the live view seen on the 27 computer screen when it was upscaled from the native size from the camera. Some pixelation was evident. The only time when this could be an issue is during critical focusing. I expect I will continue to use the Vello ShutterBoss when imaging through a telescope. I will probably use the Vello Extendá Plus when doing general photography with the DSLR on a camera tripod and astrophotography with the camera on a sky tracking mount. The Extendá Plus really shines when wanting to see a Live View on the iPad or iPhone, set exposure values remotely, and/or take photos that you want to immediately download from the camera and share with others. I have been very happy with my Vello products and their support over the years so choosing the Vello Extendá Plus was a good decision.